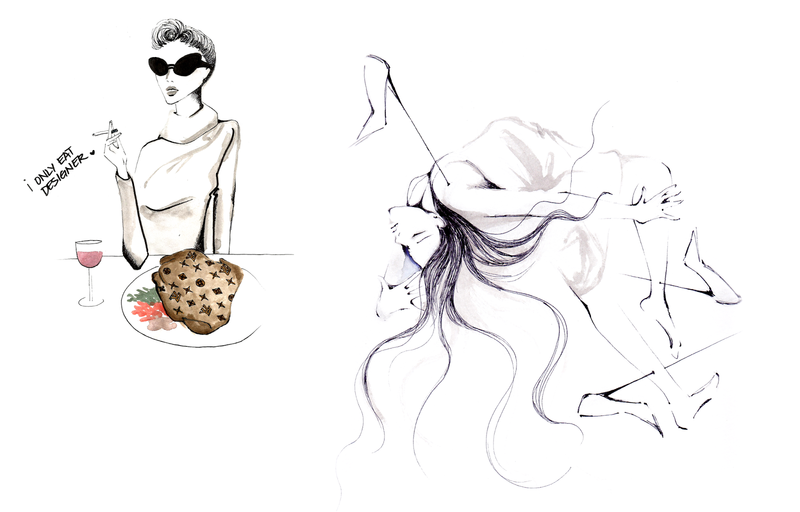 Illustrator Jamie Kan - You're not a starving artist if you have things money can't buy! I have a huge passion for shining a light on students that first found an outlet in the fashion design programs at various Vancouver area schools. 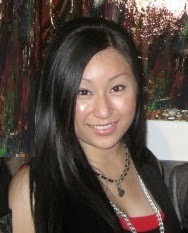 One year I had the pleasure of meeting Jamie Kan who was studying at Kwantlen Polytechnic University in Richmond. While I meet many students, it's only a small percentage I have an opportunity to spend time with so I can get to know them better. Kan is one. 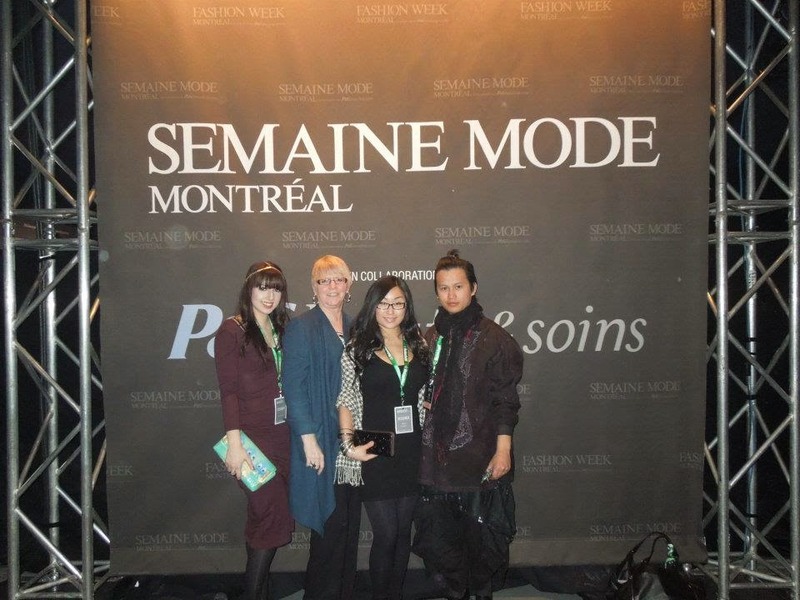 In February 2012, I travelled to Montreal for Semaine De Mode De Montreal (Montreal Fashion Week) and ended up staying in the same hotel as three amazingly friendly students from Kwantlen - Kan, Earl Lui and Christina Ferrante. It was a blast. Moments like these are what bring someone into your circle of friends and when she contacted me through LinkedIn to let me know she had decided to focus her talent on illustration, it was a no-brainer to include a Q and A here. She is warm, friendly, easy going and I love her philosophy - "You're not a starving artist if you have things money can't buy." Her illustration work speaks for itself. work that included magazines, posters, murals in a condo sales office and more. Magazine editors take note - what they bring to an issue is unique. They can take a simple retail storefront, a fashion ensemble, a table setting or sea wall stroll and turn it into something so much more than a straight reproduction - all without the effort needed to organize a photo shoot. This is not to replace photography as it is another of my favourite art forms, it's about offering a unique balance of different interesting styles. Without further ado, I offer you the words and art work of the talented Jamie Kan. Enjoy! Where were you born and what you you like as a child/teen? 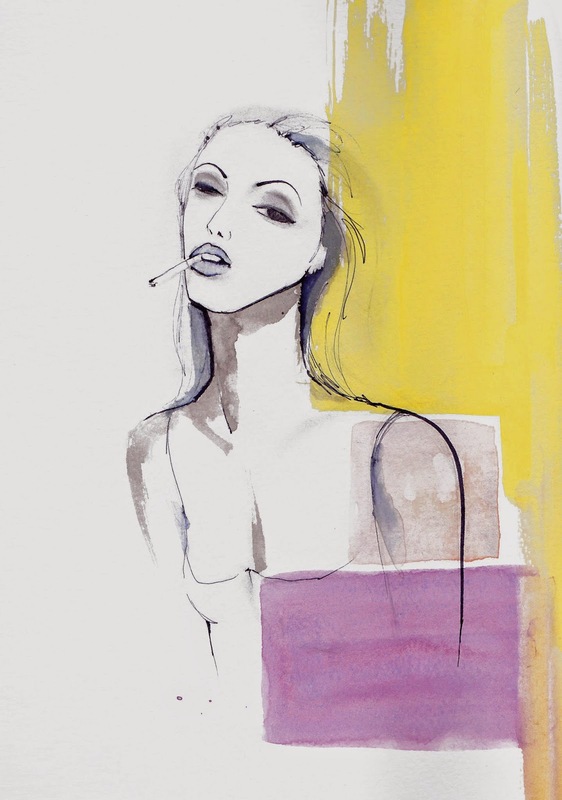 Any early signs that you would be drawn to illustration? I was born in Hong Kong and moved to Vancouver when I was 6. As a child I was curious and crafty, always watching DIY kid shows and building my own projects. Most children are hypnotized by cartoons, where I on the other hand was fascinated by Bob Ross. I think that was the earliest sign that I would be drawn to illustrating. Where did you study illustration and why did you pick that school? Any favourite memories during that time? Highs or lows? I studied illustration with an art tutor at a young age. She came to my house once a week and would give me all sorts of projects. What I loved about those art lessons was that there were no rules, and my teacher would always ask such perplexing questions like, "why did you pick this color?" or "how does this make you feel?" 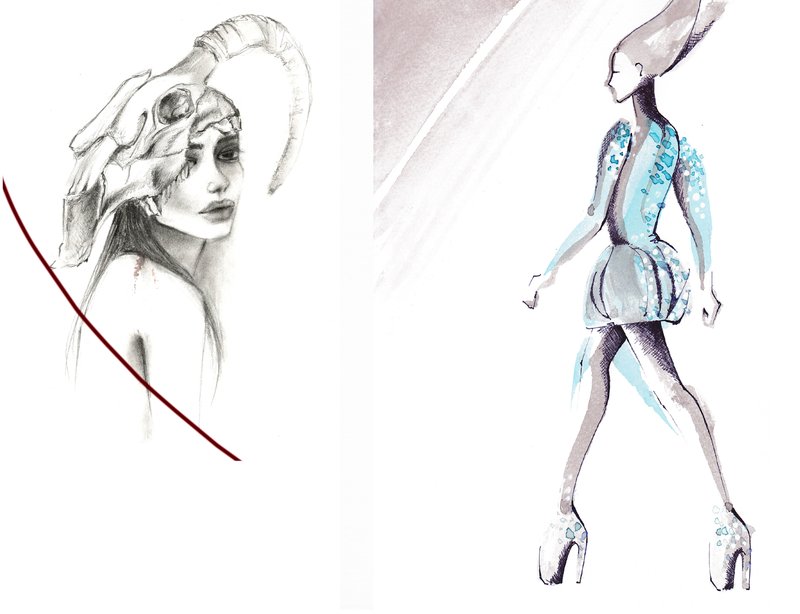 I combined my love of illustration with my passion for clothing and went on to study fashion design at Kwantlen University. During the 4 year program I more aware of who I am creatively and was finally able to answer those perplexing questions that my illustration teacher once asked. Talk about your journey since graduating? Since graduation life has been everywhere. I was hired to work in Aritzia's support office which I was ecstatic about. One year later, I left the company and jet to New York City to work for Anna Sui! Living in New York was an amazing experience. I got to attend New York Fashion Week and felt like I was breathing dreams. Fast forward half a year, I hopped to Australia where I worked freelance and traveled like nothing else existed. Now I've drifted back home and there's no place like it! Feels like I never left. Dark, ethereal, and kind of funny. Talk about inspiration. When you have an illustration to create, how does the process work for you? Where do your ideas come from? My process always start with writing. If I have an idea, I usually write about it first. I ask myself questions and maybe add a few doodles with my notes. Then I do a little research on what I'm illustrating and I get right into it. Weird to share this but I talk to myself when I draw, I feel it helps me to better visually communicate. Things that inspire me most are not considered to be conventionally artsy, like sci-fi novels, cigarettes, or pop culture controversy. 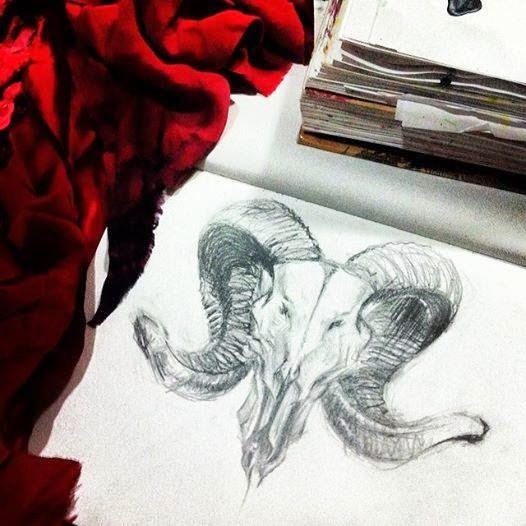 I create my work first with a pencil sketch. Sometimes I just leave it at that, and other times I would paint. I'm so in love with Adobe Illustrator and Photoshop though sometimes I can't help but to scan in and experiment! In working with magazines, what would original illustration bring to the issue? Original illustration has kind of become a sacred art in our age of technology. If a magazine has illustration features, I believe it can demand presence from a reader who's desensitized by the digital information highway. As computer graphics becomes more prevalent, illustration as an art form has lost some popularity. Why do you think it is important to the industry? What does is bring to the table that makes it unique? I think it's great that artists now are able to mix mediums between illustration and digital, but I believe it's important to preserve the strokes and lines that are created by hand. It's the difference between a novel and an audio book. I think the very thing that makes it unique is the fact that computer graphics are indeed so prevalent. When there's over saturation, people always gravitate towards something more exclusive. Don't get me wrong, I love my pen and tablet, but I started with a pencil and paper! Can you share some of the clients you have worked with? Varnish Nail Lounge, Hai Phong Vietnamese Kitchen, and Anna Sui. I'm going to continue illustrating, doing more projects and building my portfolio! I want to participate and become more involved with my local art community. I plan to move from freelance into full time with agency representation, but who knows what the future holds? Maybe I'll run off to Japan and become a tattoo apprentice! To view more of Jamie Kan's work or to contact her about working together, please visit her website at http://www.jamiekan.com/. You can follow her on twitter at @jamezkan and connect on Facebook at https://www.facebook.com/jamiekanillustration.